A good number of South Sudanese people have in recent time been able to fashion out an NBA career for themselves, however, none of them, aside from maybe Luol Deng, who Manute Bol helped to make it to the NBA, will ever have the amount of impact in which he has had, both in and out of the game. Bol, who is the only player to have blocked more shots than score points, having blocked 2,086 shots and scored 1,599 points, and also has the NBA rookie record for blocks per game, was known for his political activism and charitable causes, which was said to be the reason why he died bankrupt. Like many people who come from rural war-torn areas, Manute Bol’s date of birth was not officially recorded, although he has since been given the date of birth of 16th October 1962. It is also not clear where exactly he was born as two towns; Turalei and Gogrial, both in present-day South Sudan, have been listed as his place of birth. While growing up, Bol attended to his family’s cattle. He was reported to be around 15 years of age when he played basketball for the first time after having tried out at soccer but had to quit the game because of his height. Bol represented the Sudanese national basketball team and was also working for the country’s military when he was discovered by Fairleigh Dickinson University coach Don Feeley who convinced him to go to the United States to have a better chance of making a career out of basketball. Upon arrival in the U.S., Manute Bol was immediately drafted by the San Diego Clippers in the fifth round of the 1983 NBA Draft, however, his selection was later ruled invalid by the league who insisted that the player was not eligible for the draft. Bol went on to play for the University of Bridgeport as he brushed up on his English speaking and writing ability which was very poor. He eventually fulfilled his dream of playing in the NBA in 1985 when he was selected by the Washington Bullets with the 31st overall pick. In his rookie NBA season, Manute Bol played in 80 games, averaging 3.7 points and 6.0 rebounds. He lasted three seasons with the Bullets before joining the Golden State Warriors in 1988. In 1990, Bol left the Warriors for the Philadelphia 76ers where he spent three years before he was traded to the Miami Heat in 1993. Bol’s time in Miami was not memorable as his performance declined and for the first time in his career, he was not used as a starter. His stint in South Beach lasted for 8 games, after which he was traded back to the 76ers where he managed to play in only four games before again before being traded to another former team, the Bullets. After a journeyman 1993-94 season, Bol returned to the Golden State Warriors for the 1994-95 season where he enjoyed a mini-career resurgence, getting back into the starting lineup and returning to be the defensive force he once was. All that, however, lasted for only five games as Bol suffered a knee injury that sidelined him for the season and promoted the warriors to waive his contract. This was the end of Bol’s NBA career as in the following season, he played in the Continental Basketball Association for the Florida Beach Dogs and then in Italy in 1997 and Qatar in 1998 before finally calling time on his playing career. Manute Bol has 10 children from his two marriages. The first marriage was to Along, who had six children for him before he married Ajok Kuag, who had four children for him. Many of Bol’s sons have tried to follow in his footsteps to have a career in the NBA, however, only two have been able to make good strides. The first is Madut Bol, who played college basketball at Southern University before graduating in 2003. The second, who according to NBA experts might have a better chance of making it to the league and even surpassing the achievements of his father, is Bol Bol, a McDonald’s All-American in 2018 who currently plays for the University of Oregon and is considered one of the best prospects for the 2019 NBA Draft. How Did Manute Bol Die? Manute Bol died in the University of Virginia Medical Center in Charlottesville, Virginia from acute kidney failure and complications from the Stevens-Johnson syndrome. A memorial service was held for him at the National Cathedral in Washington, D.C. before his remains were flown back to South Sudan and buried there. 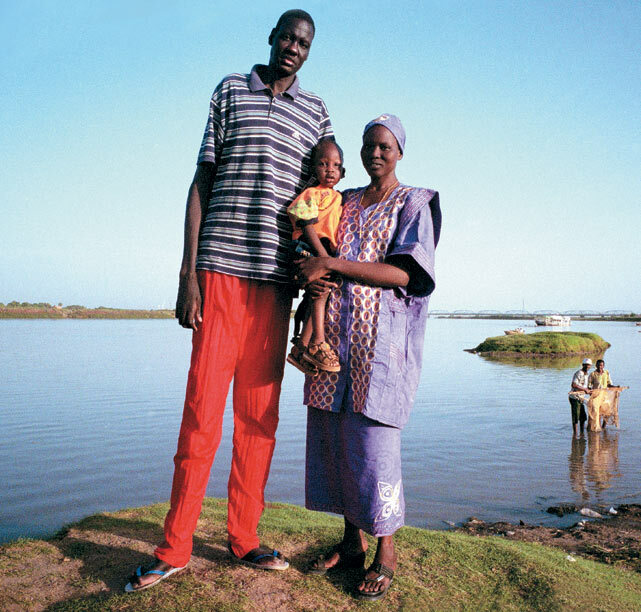 Manute Bol comes from the Dinka ethnic group that has produced some of the world’s most exceptionally tall people. With a mother that was said to have been 6 feet 10 inches (2.08 m) tall and a father that measured 6 feet 8 inches (2.03 m), it should not come as a surprise that Bol had a height of 7 feet 7 inches (2.31 m), making him the tallest player in the history of the NBA, a position he shares with Romanian Gheorghe Muresan.